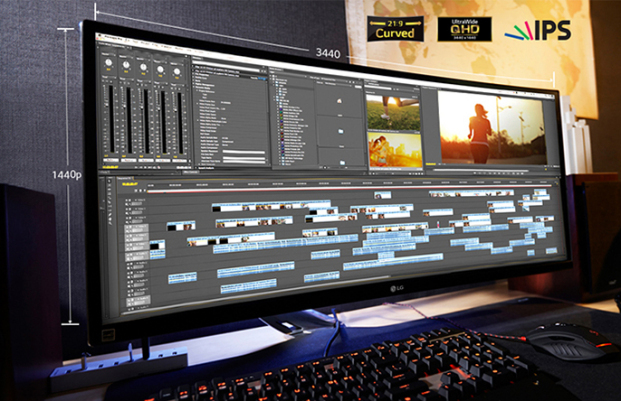 From the Manufacturer 21:9 Curved UltraWide QHD (3440*1440) DisplayThe LG34UC97 monitor is the ultimate large screen 21:9 monitor for work and play. The subtle curve of the screen offers an immersive viewing experience, enhanced by the impressive image clarity of Quad Definition. Movies, games and sports seem to come to life. Multi-taskers will appreciate the 4-Screen Split feature, which makes it easy and intuitive to view several documents at once. For professional and amateur photographers, as well as graphic designers and video editors, 34UC97 offers Mac compatibility, the dazzling data transmission speed of Thunderbolt, plus 99% coverage of the sRGB spectrum for dependable color accuracy. 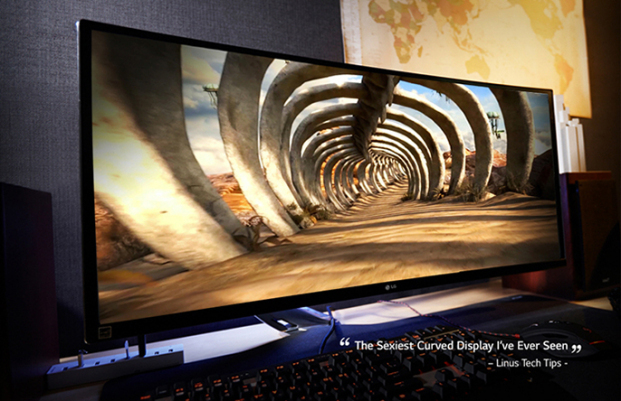 The 3440 x 1440 UltraWide QHD display offers amazingly sharp picture quality. Its pixel area is about 1.8 times larger than an UltraWide Full HD 21:9 monitor, and about 2.4 times larger than a Full HD 16:9 monitor. It provides an efficient environment in using Microsoft Office programs showing 47 columns and 63 rows in excel. *Disclaimer: 21:9 Screen or 3440 x 1440 (60Hz) resolution may not be available depending on content, device, interface or graphic card. IPS DisplayIPS (In-Plane Switching) technology enhances the performance of liquid crystal displays. Response times are shortened, color reproduction is improved, and users can now view the screen at virtually any angle. 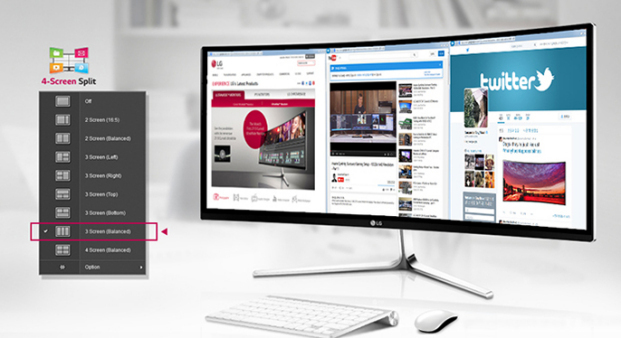 Mac Compatible / ThunderboltGraphic designers will surely appreciate the many features of LG's Mac®-compatible UltraWide monitor. 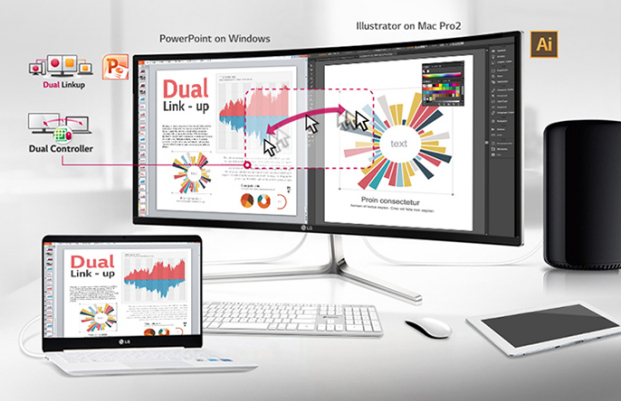 The 21:9 widescreen and 4-Screen Split will simplify working with multiple graphics windows. (Disclaimer: Mac is a trademark of Apple Inc., registered in the U.S. and other countries.) 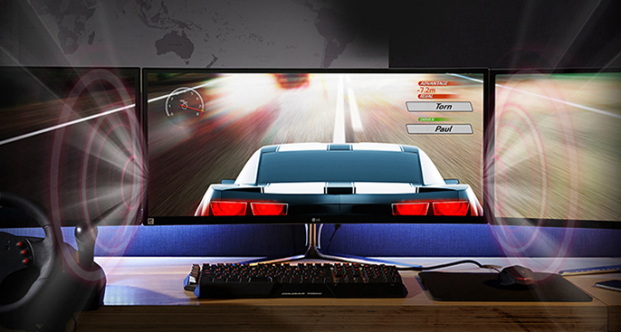 This monitor's Thunderbolt input/output port allows you to connect up to six compatible devices, moving data between them with incredible speed. The two channels of 10-gigabits-per-second throughput in both directions are up to 20X faster than USB 2.0. 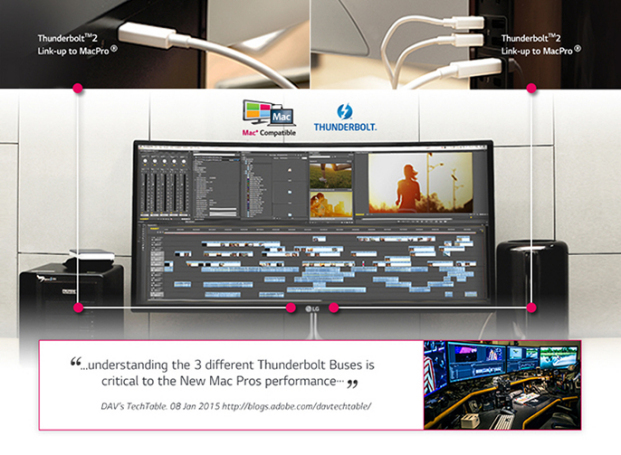 Thunderbolt is an exciting innovation for both expansion and premium video display. 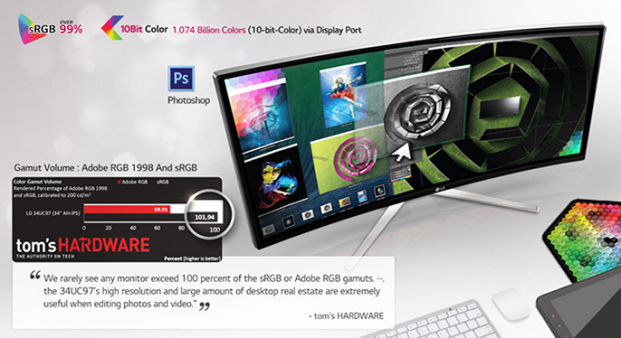 sRGB over 99%sRGB is the standard color space of ideal color reproduction. So, with over 99% coverage of the sRGB spectrum, this LG monitor is a great solution for professional photographers, graphic designers or anyone looking for highly accurate color. *Disclaimer: Color mode conversion between Adobe RGB and sRGB is available on the "Color Mode" menu. Screen SplitThe 4-Screen Split feature improves productivity by simply re-sizing the windows on your screen. With one drag you can re-size one window and the other windows automatically to fit the available space. It allows from 2 to 4 windows to be shown in 8 different screen ratios without feeling cluttered. MaxxAudio® + Stereo SpeakerUsing MaxxAudio® technology you will experience deeper bass and crystal clear highs. Equipped with two 7w internal speakers and MaxxAudio® technology , the 34UC97 provides cinema surround- like sound, allowing you to enjoy movies without any extra external speaker or sound output equipment. Multi-PortsYou can connect to various devices with the two HDMI and two USB 3.0 ports, and a Display Port. And, If you have a Mac, you can connect directly to the 34UC97 via Thunderbolt 2™, which transmits data more than four times faster than USB 3.0. Dual Link UpThe Dual Linkup feature allows two compatible portable devices--such as a computer, camera, phone, or Blu-ray player--to be connected to the monitor, and both can be viewed on the same screen simultaneously. Note: To use Dual Linkup, one device must be connected to the DisplayPort while the other is connected to either the HDMI or DVI port. Energy Star QualifiedEarning the ENERGY STAR® rating means that a product meets strict energy efficiency guidelines set by the US Environmental Protection Agency and the Department of Energy. For monitors, it means they save energy both in standby and active (powered on) modes. ENERGY STAR-qualified monitors use about 25% less energy than standard units.